Home » Flags » Sewing and refinishing / repairing flags... retiring flags. Sewing and refinishing / repairing flags... retiring flags. A flag flyer will tell you, flags don't last. The elements, wind, rain, snow, ice, sun, dust, mud, smog. If it is outside, it will at some point, get on the flag. While we have come a great deal on fade resistant, environmentally safe dyes on UV protected fabrics for extended outdoor abuse, the flag's weakest links are in the links themselves, or the stitching. The thread which pulls the star field and stripes together. That frays, the fabric stars to tear and rip. But what can you do? We'll show you ways to extend flag life, and signs of when the flag just needs retired. If you have the time, you fly a larger flag (recommended for 6x10 ft. and up), you can bring the flag down, re-hem the fly ends, reinforce the corners, and get another several months out of it. We typically do this for very large flags (20 x 30 ft. and up). The trick is to have a spare flag, take the flag down before the fray gets too bad. That is good news for your budget. But even this has it's limits. We never want to go out and tell a company to retire a flag. Particularly if they are caring for the flag with such zeal as this video example; a custom light, a nice 40 ft. flagpole, a great parts system and well maintained flagpole parts. Clearly, this company takes pride in it's appearance. Moreover, you can tell the flag has been repaired several times. 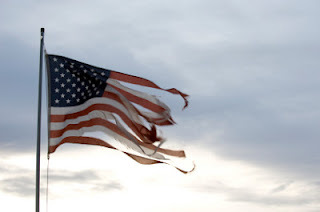 This flag has been to battle and back, each time, being stitched up and sent back out. And each time, the fly-end gets short and shorter, until eventually, it becomes a square. The American flag was originally 10:18. To this day, post offices around the country fly 5 x 9-1/2 ft. But the industry standard has changed to 5:8 or 5 x 8 ft. Many countries have a 1:2 ration, 4 x 8 ft. etc. As you sew or re-hem the flag, you change the ratio slightly, Once the flag becomes a square, it really doesn't continue to be an American flag. Just shows, even the measurements of a flag contribute to its identity.